ZephIR Lidars industry-leading, turbine-mounted Dual Mode (DM) system has been deployed by developers Renewable Energy Systems Ltd. (RES) in a first-of-its-kind commercial investigation into lidar-generated turbine performance measurements. 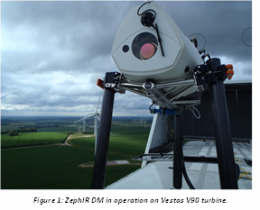 This pioneering trial, which began in June 2013 and is expected to end in November 2013, uses a ZephIR DM installed on a Vestas V90 turbine. The ZephIR DM is uniquely capable of measuring upwind; wind speed, shear, turbulence and veer. The DM was chosen for its ability to provide absolute (traceable to IEC Standard 61400-12-1CD) and relative power curve assessments both hub-height and rotor-equivalent. In non-complex terrain, current industry guidelines require measuring the wind at distances of two to four rotor diameters upwind  minimising blade induction effects on the wind speed. Complex terrain causes the wind model to evolve as it moves over the landscape approaching the turbine, meaning that the wind and available energy at the turbine rotor can differ significantly from the measurement point. To combat this uncertainty, wind speed can be measured much closer to the turbine. Although these measurements are within the blade induction zone, their repeatability is higher and will be less influenced by the complex terrain. The ZephIR DM and ZephIR 300 are the only commercial lidar systems with the ability to measure at distances as short as 10m, and out to 300m. With the ZephIR measuring at 135, 90, 45 and 10m ranges in its second phase, the trial exploits the DMs unique ability to measure short distances upwind of the turbine within complex terrain to produce power curves. RES is one of the worlds leading independent renewable energy project developers with operations across Europe, North America and Asia-Pacific. At the forefront of wind energy development for over 30 years, RES has developed and/or built more than 7.5GW of wind energy capacity worldwide. In the UK alone, RES currently has more than 1GW of onshore wind energy either constructed, under construction or consented. RES is active in a range of renewable energy technologies including large-scale biomass, solar, wave and tidal and on-site renewable installations. For more information, visit www.res-group.com.